A cool, cloudy day welcomed the FlatOut Race Series (FORS) when it staged Round 3 last May 20, 2017 at the Batangas Racing Circuit. Although intermittent rain made conditions tricky, it did not impede the on track action that heated up in the afternoon. 80 entries competed in the day’s Time Attack and Grid race, where JC Baguisa of Blanche Racing set the quickest lap of the event. This allowed him to claim victory in Bracket R and qualify on pole. However, it was Dondon Portugal in the #151 Maptan Logistics Mitsubishi Lancer Evolution 7 who dominated the 12-lap GT Radial Grid A race. In Time Attack, Baguisa set a time of 1:49.792 earning him 1st place in both Bracket R and Bracket A. Rafael la O’ in the #1 Honda Civic EK was 2nd with his 1:49.805 best. Just 0.016 secs behind was 2016 champion Eduardo Suiza with a 1:49.821 time. Bacolod native Jero Consing in the #133 Honda Civic EG Hatchback topped the time sheets in Bracket B with a near-perfect 1:56.006 lap. Aaron Lao was again 2nd, while Zebedee Mendoza came in 3rd. Paul Santos of Team Big Chill Racing placed 1st in Bracket C with a time of 1:59.517. Series newcomer Bubi Camus managed 2nd best in his Mazda MX-5, and lady driver Kathy Villar did a great job to end up in 3rd. Bracket D had the most entries of the day with 10 competitors. The fastest drivers were Andrei Lim, Kikong Dela Rama, and Arbie Jacinto whose best times were only 0.098 secs apart. Lim was 1st, followed by Dela Rama in 2nd, and Jacinto was 3rd. In Bracket E, Mark Bernardo’s best lap edged out 2nd placer Mars Ocampo by only 0.005 secs giving him 1st place. Robert Tan and Lars Alonzo traded places in Bracket F from the previous event. Alonzo would take 1st place this time while Tan had to settle for 2nd. In 3rd was Ralph Tan. Finally in Bracket G, top honors went to Francisco Blanco in 1st, Andre Makkina Tan in 2nd, and Greg Suing in 3rd. In the Grid Race, Dondon Portugal was able to leapfrog the competition in GT Radial Grid A. He got good traction off the line and was up to P1 by the end of the opening laps. With his exceptional pace, he built a significant lead throughout the 12-lap race to win by almost a 20 sec margin. JC Baguisa held onto 2nd place after an intense battle with Eduardo Suiza, while Rafael la O’ did an outstanding job to finish 3rd in a borrowed Mitsubishi Lancer Evolution after his car broke down in the morning. Blanche racing teammates Aaron Lao and Andrew De Asis were trading places on every lap in KYB Grid B. The 2 eventually made contact, but were otherwise able to continue. Lao took the chequered flag in 1st, followed by De Asis in 2nd and Francis Roger Talan in 3rd. Paul Santos had a lonely race in SmartFuels Grid C, finishing a lap ahead of 2nd placer Arbie Jacinto. The highlight of the day were the battles in the Recaro Grid D race. Raymond De Pano in the #480 SB Salon Toyota Corolla AE92 had blistering pace in the early stages, but retired after 3 laps. The remaining fight between Zacharry Mendoza, Mark Edwin Bayan, Jack Saquilayan, Robbie Alvarez, and Andrei Lim got so intense that all 5 drivers broke out of the bracket and were eventually penalized. In the end, Paolo Santos was awarded 1st place, followed by Mark Bernardo in 2nd and Ronn Catindig in 3rd. In Works Bell Grid E, Pathrick Bautista with the #520 Mazda 2 barely nosed out Ralph Tan in the #69 Honda Civic EG. They crossed the finish line with a scant 0.073 difference. Taking another 3rd spot was Lars Alonso who finished a further 1.5 secs behind. 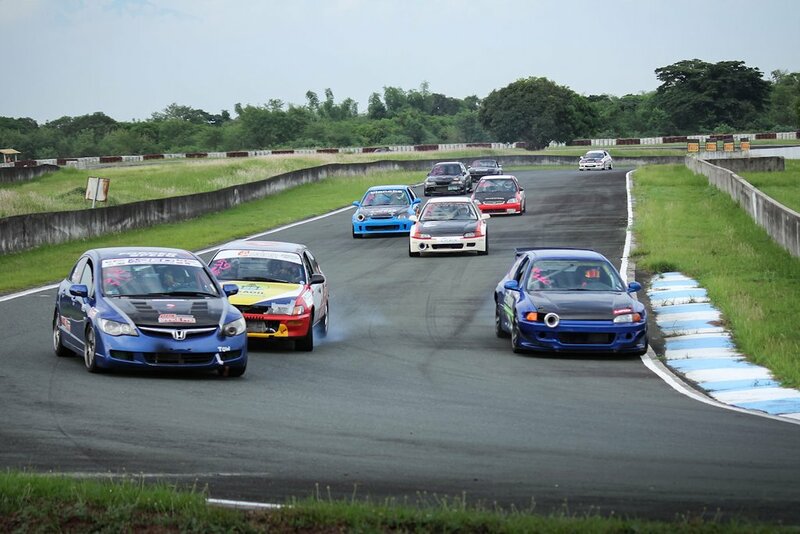 The FlatOut Race Series (FORS) will be back at the Batangas Racing Circuit for a double-header weekend. Round 4 is on June 3, while the inaugural GT Radial x 4 Oras ng Pilipinas endurance race will be held on June 4.